"I know when you come to my house you will fix it right the first time." Jim Smith, Boston, MA. "I am so happy with my new floors. They are just beautiful." Carolyn Jones, Waban, MA. "Your service is the greatest!" Mike Doe, Natick, MA. 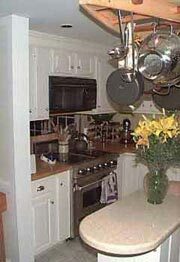 A new kitchen we installed for one of our many satisfied customers.